In writing about what struck as the president's essential aloofness, I said there were echoes of it even in his organization. I referred to a recent hiring notice from the Obama 2012 campaign. "It read like politics as done by Martians. The 'Analytics Department' is looking for 'predictive Modeling/Data Mining' specialists to join the campaign's 'multi-disciplinary team of statisticians,' which will use 'predictive modeling' to anticipate the behavior of the electorate. 'We will analyze millions of interactions a day, learning from terabytes of historical data, running thousands of experiments, to inform campaign strategy and critical decisions.' "
This struck me as "high tech and bloodless." I didn't quite say it, but it all struck me as inhuman, unlike any politics I'd ever seen. It was unlike any politics I'd ever seen. And it won the 2012 campaign. Those "Martians" were reinventing how national campaigns are done. They didn't just write a new political chapter with their Internet outreach, vote-tracking data-mining and voter engagement, especially in the battleground states. They wrote a whole new book. And it was a masterpiece. Hats off. In some presidential elections, something big changes, and if you're watching close you can learn a lesson. This was mine: The national game itself has changed. And it's probably going to be a while before national Republicans can duplicate or better what the Democrats have done. 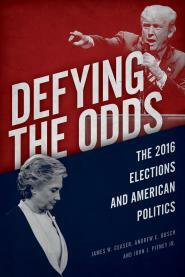 In the immediate aftermath of the 2012 presidential campaign – like any campaign – two things happened: the winners went to bragging and the losers started pointing fingers. One thing became clear. Obama for America’s digital, technology, and analytics teams were indispensable in securing the president’s reëlection. OFA was, far and away, the most sophisticated political organization on the planet. And Republicans needed to learn from them. So we set about gathering insights, data, and anecdotes from hundreds of news articles, blog posts, interviews, podcasts, and presentations. Our findings have been collected and organized into a single slide deck called Inside the Cave, which you can download here. The Cave is what OFA called the windowless room that housed their analytics team. Like digital in 2008, analytics came of age in the 2012 campaign. OFA’s analytics team had 50 staffers. By comparison, the Romney-Ryan campaign had a data team of 4 people. 1. Send A LOT more email than 2008 (at least 404 national fundraising emails in 2012). 3. Make people think they were going to lose. More than 2.2 million Americans have already chipped in for us, and I'm so grateful for it. As we face this week's fundraising deadline, please make a donation of $3 or more today. Did Citizens United End Up Helping the Left?